The four principles of organic agriculture, as laid down by the International Federation of Organic Agriculture Movements, are not so well known among farmers or scientists, and the understanding and interpretation of these principles is often rather vague. A main statement of the principle of health is, for example, that ‘Organic Agriculture should sustain and enhance the health of soil, plant, animal, human and planet as one and indivisible’. 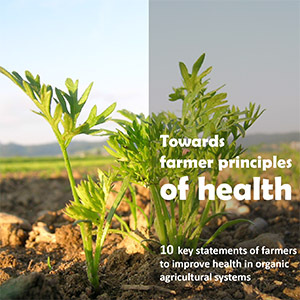 One of the aims of our recent HealthNetworks project was to identify which principles farmers have developed that make them successful in developing healthy farming systems. What personal philosophies and visions of best practice do farmers follow to improve the health of soils, plants, animals and humans? Anja Vieweger wrote in the ORC Bulletin No.122 on the project’s findings.